Wonderware: Trouble Connecting Legacy Hardware to SCADA system? Trouble Connecting Legacy Hardware to SCADA system? Deliver plant automation for integrated systems including lumber sorting, presses, boilers and dryers. Enable smooth upgrades and updates as the plant and its equipment expand over time. With plant expansions, legacy systems had to be integrated with solution upgrades and updates. Reporting requirements mandate that Boise Cascade retain 90% of their historized data for quarterly and semi-annual reports as well as audits. Updates and upgrades to the existing systems are seamless and efficient. Centralized data acquisition and storage has eliminated the need for hard paper files to meet the extensive back up data retention requirements. The solution’s trending and tuning capabilities have enabled Boise Cascade to realize a 10% improvement in fuel consumption of the hog fuel boilers. Environmental responsibility is a basic business requirement. But perhaps the industry where this principal is most prominent is building products manufacturing. And when it comes to the framing lumber and plywood used to build homes and businesses, most of the materials come from the Pacific Northwest of the United States. Today, manufacturers work hand in hand with regulators to meet standards which reduce the burden on our environment. Controlling processes and conserving energy while producing a quality product are the mutual goals. As the second largest softwood plywood manufacturer in North America, Boise Cascade is a leader in environmental stewardship. All of their mills are certified by the APA Engineered Wood Association, which ensures consistent product performance. The company was established in 1957, and the Elgin, Oregon facility has manufactured plywood and stud products since 1968. Over that time, Boise Cascade’s management has continuously invested in technology to support both sustainability and the production of superior goods. 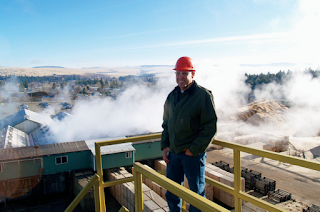 The search for a partner that would help Boise Cascade meet their high standards began in 2003. 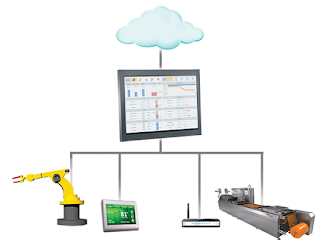 The Wonderware InTouch Human Machine Interface (HMI) was introduced as part of an OEM solution for a standalone single-node dryer system. Then in 2006, when extended environmental reporting capabilities were required, Wonderware Historian was added. Additional consulting has been provided from time to time since 2007 by Apex Manufacturing Solutions, a Wonderware-certified Systems Integrator, showing that teamwork to leverage the installed base and other supporting applications is integral to the ongoing strategy. 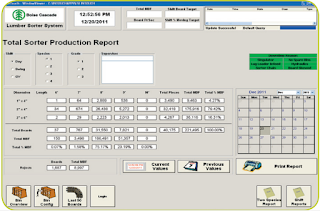 As Boise Cascade envisioned expanding HMI capabilities from the dryer system into other areas of the plant, the advantages of the solution made the decision to standardize on Wonderware easy. Noble stresses scalability through “reusable engineering which guarantees easy and reliable implementation” as the major factor in the decision to grow with Wonderware products. Template-based development and simplified network configuration mean that Noble and his team can bring new capabilities to other parts of the plant rapidly without investing in new hardware or control systems. Remote application deployment and change management are also facilitated by the solution. When high or low alarm states occur, the HMI provides visual information on screen as well as automated notification to personnel via email and text messages, ensuring the team’s peace of mind. In 2006, the Oregon Department of Environmental Quality handed down new regulations for boiler opacity and dryer regenerative catalytic oxidizer (RCO) pollution monitoring. Turning to partner Wonderware PacWest, management approved the incorporation of Wonderware Historian to fulfill these requirements along with additional capabilities. Because permits require that Boise Cascade captures and maintains at least 90% of plant data, Historian first and foremost helped by eliminating mountains of hard paper files and hundreds of hours of manual processes by automating management of the data. Not only that, but the visualization capabilities in Historian help employees to see and understand the data as they prepare reports, whether for regulatory agencies or for Boise Cascade’s business management executives. Data from the various systems is unified for consistency, and trending reports show how the plant is performing. 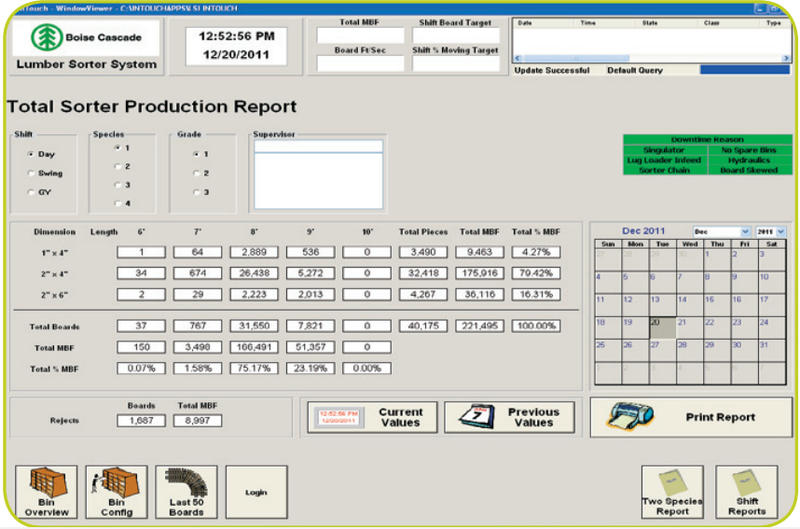 These reports can be used to tune operations and result in significant improvements. For instance, Boise Cascade has been able to reduce fuel consumption by enhancing boiler combustion efficiency. Historian’s trending and tuning capabilities have resulted in a 10% reduction in fuel consumption — a measurable benefit that drops right to the plant’s bottom line. And Noble emphasizes the Boise Cascade commitment to Wonderware. “Our confidence in the integrity of the data we get from Wonderware InTouch helps in the success of our future business decisions. We feel that the supportability of new versions is unmatched when compared to other products".